Laparoscopic Subtotal Cholecystectomy. A Safe Alternative! Background: Laparoscopic cholecystectomy is a hazardous operation when anatomy of triangle of Calot is distorted by acute or chronic inflammation. In these difficult situations, laparoscopic subtotal cholecystectomy (LSTC) is an alternative to conversion to open surgery. Methods: Retrospective analysis of data obtained from a prospective database on patients who underwent LSTC in the past three years (January 2006 till date) were reviewed. We analysed in this group of patients the indications, associated co-morbidity, safety, complications and their management. Results: Of 332 patients who underwent laparoscopic cholecystectomy during the study period thirty four patients underwent LSTC. Twenty five were males and 9 females with median age of 58 years (range 20-78 years). The indications for surgery in these patients were: empyema gall bladder (n=19), acute cholecystitis (n=3), chronic cholecystitis (n=6), chronic cholecystitis with giant common bile duct calculus, Mirizzi’s syndrome and cirrhosis in 2 each.. A decision to perform LSTC was taken at surgery in all patients because of obscure Calot’s anatomy. The gall bladder neck was managed by endosuturing of the stump (n=14), using an Endo GIA (n=11), serial clipping (n=2) and stump was left unsutured with a drain only in 7 patients. Ten (29%) patients had morbidity. Bile leaks were seen in 4 (11.7%) patients, 3 closed following ERC and stenting and one closed spontaneously. None of the patients had a wound infection and there was no mortality. There was no bile duct injury. The median postoperative stay was 3 days (range 2-9 days). On follow-up, no patient has presented with biliary symptoms or common duct calculi. . Conclusions: LSTC has potential advantages of shorter hospital stay, no wound infections, no biliary injury and avoids conversion to open cholecystectomy. 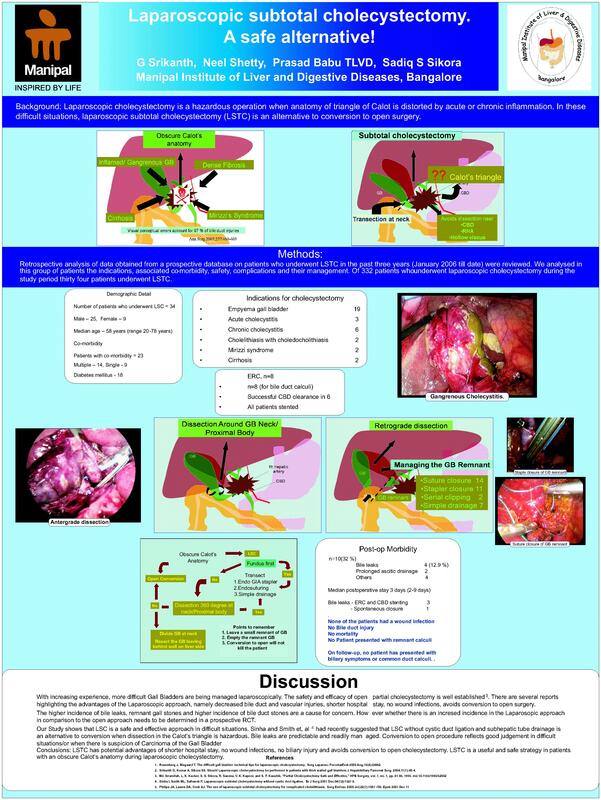 LSTC is a useful and safe strategy in patients with an obscure Calot’s anatomy during laparoscopic cholecystectomy.